New Print from Dave Kinsey released through Black Market Gallery titled "Unintended Consequence" (Pictured Above). We have been big fans of Kinseys work and his screenprints for a number of years but as nice as this image is we are not massive fans of Giclée Prints. The Giclée is on Somerset 330gm an edition of 50, signed/numbered/stamped. 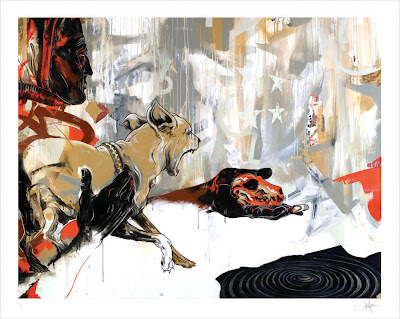 The print is huge at a 34 x 43 inches and is available from BLK/MRKT for $600.